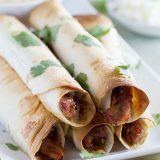 Pork gets slow cooked in a sweet and spicy sauce and then turned into an easy dinner with these Slow Cooker Sweet Pork Baked Taquitos. The craziness of school nights has already gotten to me. Yes, I know that school has only been in session a few short weeks, but I’m already feeling it. We wake up pretty early (Abbi catches the bus at 7:25am) and then I feel like it’s go-go-go trying to get things done during the day while she’s at school. I’m either taking Easton to or from preschool, going to the grocery store, running errands, doing laundry, attempting to keep my house clean, do a little cooking, and keep Camden entertained at the same time. And then once Abbi gets home, it’s homework and gymnastics and playtime. I think every night I end up looking up at the clock, wondering where the day has gone, and realizing I should have started dinner an hour ago. 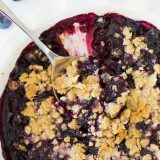 So I am doing what a lot of parents are doing right now – stockpiling easy recipes. Now, you all know that I’m always about the easy, fast recipes, but they are even more important now – necessary even. Which is why you might start to see more slow cooker recipes popping up around here. Not only are they typically easy to put together, but they make dinner time a whole lot less crazy and rushed. 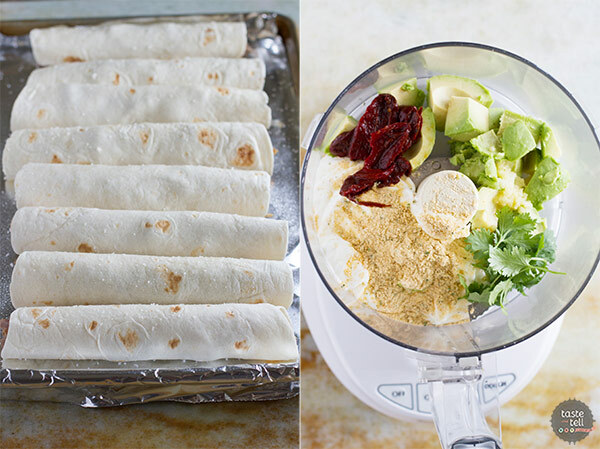 Today’s recipe is inspired by my love of taquitos and the convenience of slow cooking. I have been on a bit of a pork kick lately, and this sweet pork recipe is so super simple. You start by browning the pork. This is a step that I think is really important to add some flavor and texture to slow cooker meals. It only takes a few minutes, and those minutes really pay off in the end. The pork is combined with Old El Paso green enchilada sauce, some brown sugar, and a tiny bit of liquid smoke. Then it gets slow cooked until it is tender and it pulls apart into sweet pork goodness. 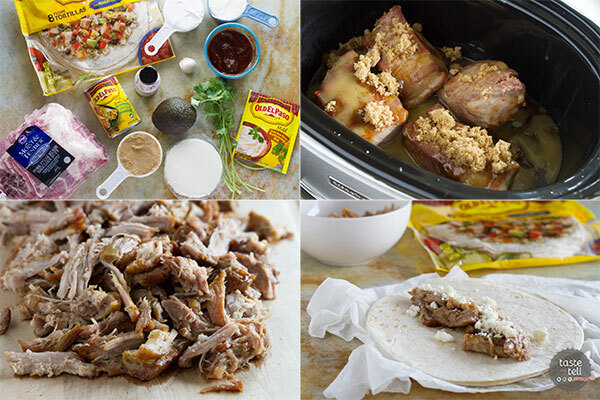 Once the pork is cooked, all you have to do is roll the pork in some Old El Paso tortillas with a little bit of queso fresco, and then bake until crispy. The trick to make them crispy is to spray them with a spritz of cooking spray before baking. And I love the addition of a little bit of kosher salt sprinkled over the top. 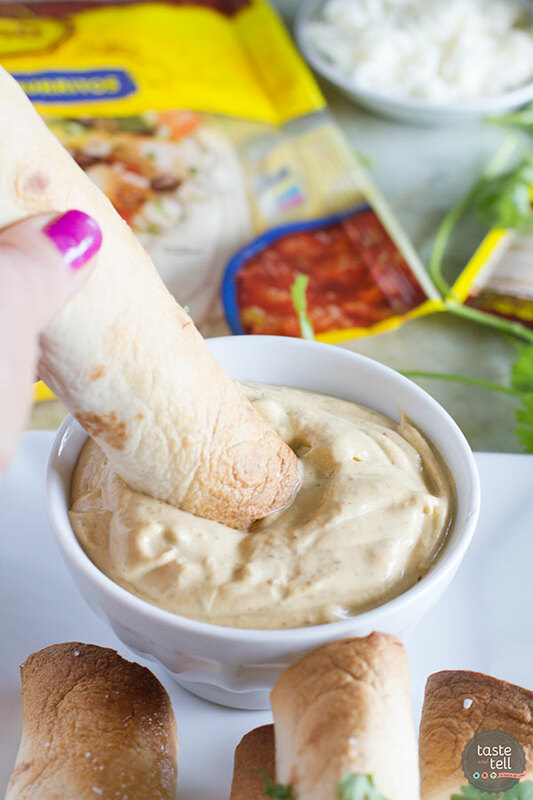 It doesn’t end there – you throw a few ingredients into the food processor to make a creamy, spicy sauce to dip the taquitos in. 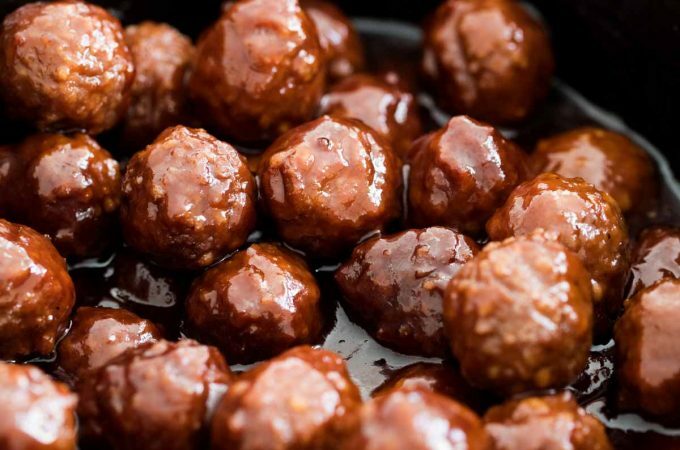 The combination of the pork and the dipper makes for a perfect sweet and spicy meal. So take a deep breath, start dinner in the morning – you’ve got this whole back to school thing!! Cut the pork into 4 equal sized pieces. Cut off any large pieces of fat. Heat the oil in a large skillet over high heat. Add the pork (working in batches if necessary) and brown on all sides. Transfer to a slow cooker. Pour the enchilada sauce over the pork, then sprinkle on the brown sugar and the liquid smoke. Cover and cook for 4-5 hours on high or 8 hours on low. Preheat the oven to 425ºF. Line a baking sheet with foil. Once cooked, remove the pork to a cutting board. When cool enough to handle, shred with 2 forks. 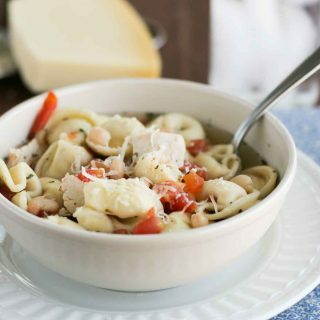 Using a spoon or a ladle, try to skim off as much fat as possible from the liquid left in the slow cooker. Add the shredded pork to the liquid and stir to coat. Cover the tortillas with damp paper towels and microwave on high for 30 seconds to warm up the tortillas. Use a slotted spoon to remove some of the pork from the slow cooker and place down the center of the tortilla. Sprinkle on some of the queso fresco. Roll the tortilla around the filling then place on the prepared baking sheet. Repeat with the remaining tortillas and filling. Spray the tops of the taquitos with nonstick cooking spray, then sprinkle on kosher salt. Bake until the ends are golden brown, about 15 minutes. While the taquitos are cooking, combine the mayonnaise, sour cream, avocado, chipotles, garlic, seasoning and cilantro in a food processor. Process until smooth. Serve the baked taquitos with the Creamy Chipotle Avocado Sauce. I am in a working relationship with Old El Paso, and this post has been sponsored. I’m so glad to be able to work with companies and organizations that I truly believe in. Thank you for supporting them, too. I think sweet pork is the best invention ever. And these taquitos look AMAZING! And that dip too! Is it bad that I already feel this way and i don’t even have kids yet?! Bring on the easy recipes! 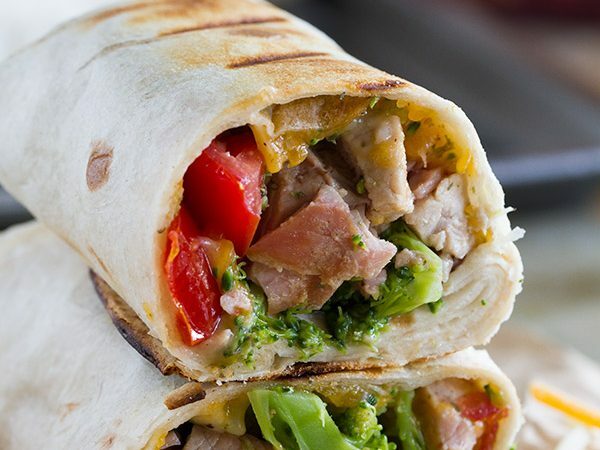 OH MY GOSH, Move over Taco Tuesday, because Taquito Tuesday is coming to town! 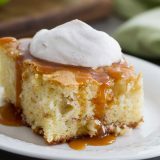 I love that you made these with pork AND in the slow cooker! Pinned! 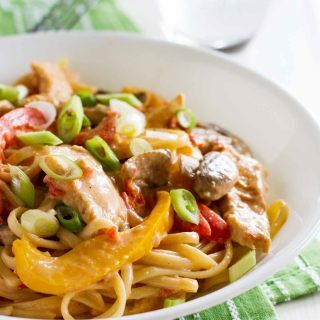 I am all for an easy weeknight meal made in the slow cooker. That pork looks extremely tender. Love these! They look so crispy and delicious. A perfect way to feed the family. So you might have noticed I’m on a slight Mexican food kick lately since our trip to Cancun! I can’t stop!!! Also, this is our first year with someone going to school. Holy smokes- I need all the quick meals I can get!! Slow cooked pork is one of my very favorite things to eat. 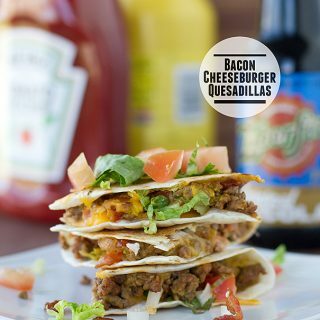 I love what you did with these taquitos! These look amazing Deborah! 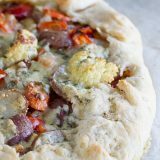 Perfect for dinner OR game day! LOVE! I don’t have kids, but I’m still crazed on weeknights and stockpile easy recipes. 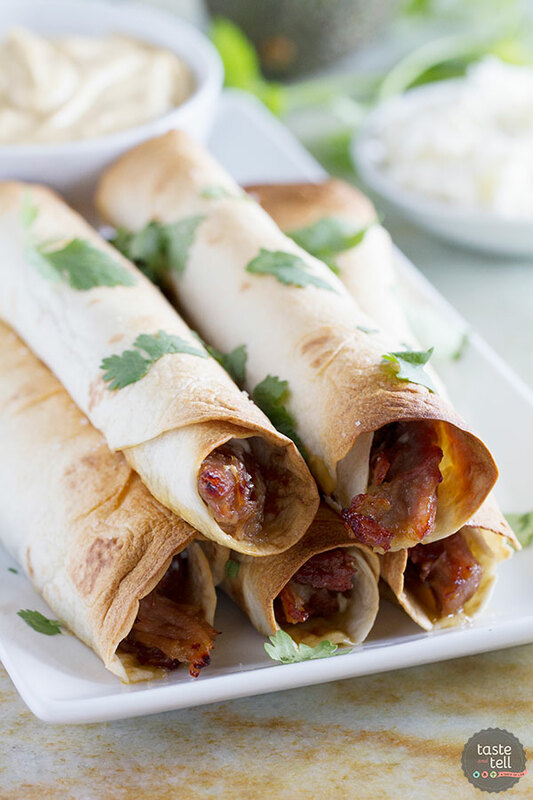 🙂 Taquitos are one of our favorite and I love that you did the pork filling in the slow cooker. 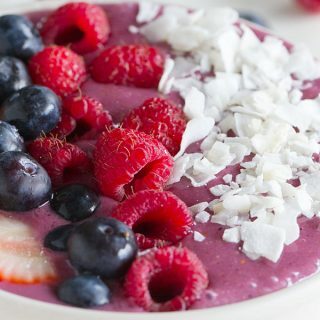 These look simple and delicious! I love everything about this dinner, from the slow cooker to the sauce, this is everything I want to in our evening meal!